Colors displayed on your monitor may vary from the actual fabric color. Please view a fabric swatch in person, come in to our store, or call us to check availability on ordering a swatch from the designer. A $10 fee may apply. Your dress is made to order - not custom made to your measurements. Measurements are taken simply to compare to the size chart to decide which size is closest to your measurements. Refer the style chosen to verify which measurements take top priority. For example: The natural waist and bust will be most important for a-line or ball gown style, while all your measurement especially the fullest part of the hips is crucial in fitted style. Be sure that each of your measurements fall in line with the size that you are order. These dresses are made according to the size chart and may have little to no seam allowance to let out. Please contact our bridesmaids stylist for further assistance if needed. Keep in mind that dresses are made to a standard length. If you are between 5'8" and below you may have to accommodate the length through alterations. Order extra length if you are 5'8" or taller. 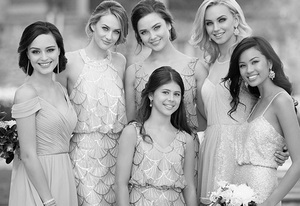 Please contact our bridesmaids stylist for more information about length. This item is made to order please allow 10-16 weeks for delivery. We strongly recommend that you order your dress 4 months before the event, or earlier. Plan accordingly to receive your order at least 2 weeks prior to the wedding/event. Full payment for your order is required. Any changes must be made within 24 hours of purchase. We are unable to change sizes or cancel order after this time. No exceptions. All of our special-order garments are made only after you order is placed, all sales are final. Dimitra Designs will provide the requested style, color, and length of dress in the size you have selected based on your review of the size chart. Dimitra Designs is not responsible should an incorrect size be ordered, please be sure to refer to the designer’s size chart when ordering. For more than 30 years Dimitra Designs has embraced many customers as part of our own family from the moment they walk throught our doors. Our experienced and understanding consultants listen to your desires to help you make the best decision for your special day. 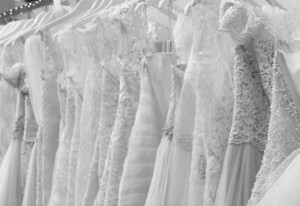 With a range of over 1500 designer gowns in-store, there is no need to worry about cost. Located just outside of downtown Greenville, SC, this “one-stop-shop” will gladly cater to your entire wedding party and bring you closer to fulfilling your ideal wedding vision. Come enjoy this unparalleled bridal experience today!